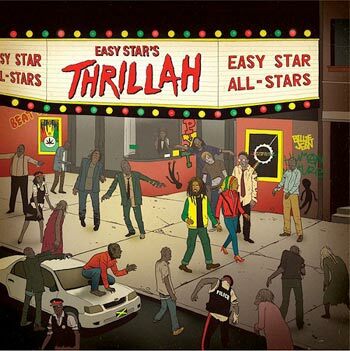 Just when you thought that the Easy Star All-Stars couldn't come up with a better idea for a cover album, boom, they hit you with "Easy Star's Thrillah." This is an amazing reggae version of the Michael Jackson classic, released just a day before MJ would have turned 53 (Rest in Peace, Michael). One thing about Easy Star cover albums is that they really do their research. From front to back, they make sure the original album is intact, with respectful renditions that are just too good to be true. My first experience with the Easy Star All Stars was back in 2006. I was in Maui, and a friend of mine put on their debut, "Dub Side of The Moon," while we were driving around Kihei. One of her friends had mentioned it to me at a party the night before, that there was a reggae version of Pink Floyd's "Dark Side of The Moon," and I was completely oblivious. She put this on and from the intro I was hooked. Definitely was stood out to me was their version of "Wanna Be Startin' Somethin'," which brings an afrobeat vibe to the party. Lovin it! Cop the vinyl at a decent price on Easy Star's website. Go for the Vinyl and T-shirt bundle! 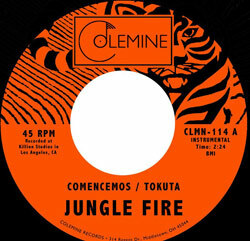 I had the honor of reviewing the debut 7-inch release of LA based afro-latin funk band, Jungle Fire, on the Beat Swap Meet blog. Check it out here.